"Set everything up"...there is only one setting mentioned for FCPX, or am I completely missing something? “Show HDR As Raw Values” is mentioned 3 separate times in the PDF. 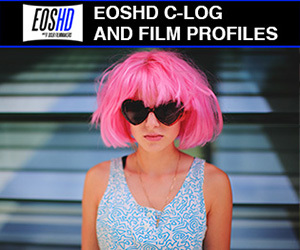 I'm not seeing any other settings mentioned other than the EOS match LUT, which isn't related to the HLG color issue. Love this, so impressive and wonderful colours. The only technical downside I can see is slightly difficult highlight rolloff, but that's nitpicking. I'm curious, I love the movement in this, were you using a glidecam for a lot of the shots? Gimbals have become so impressive but the movement is smooth and has a very natural feeling. Wow, very impressed. I have the Crane as well but find it a touch annoying when it's movement makes a robotic jerk to the left or right. Boring alarm (!!) , but mind if I ask whether you've inputed your own custom settings? It has a very natural feeling, but that could also be down to the good edit. Kudos either way, I know how hard it is to make random meetups or events cinematic but you did a great job. 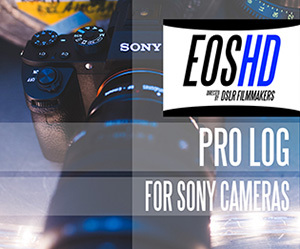 I don't own EOSHD Pro IV yet, but thinking of buying it (if I get an a7 III). Is there an easy way to reduce the saturation in the red skin tones? The colors do look Canon-like in the examples, but I would prefer less red in the skin tones. Just a test I did yesterday shooting with a7III ProColor HDR and lightly graded. I'm going to buy this in the coming days, but I just want to get one thing clearified first. How do I expose this? Normally or +1.5 - +2.0 like I do with S-log? I know that the ProColor it’s made for having color straight out from camera, with little or without color grading in post. 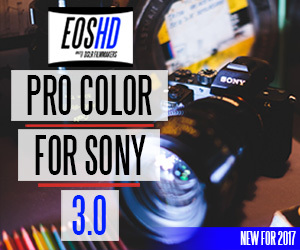 But how about using LUTs with the pro color profile? Anyone tested some LUTs shooting ProColor or ProColor HLG? I will shoot some commercial footage next monday and I want to try ProColor (already bought), and I want to try some LUT color grading. Anyone has tried it? Can anyone share some results? Everything should be all right, but remember to use LUTs designed for Rec709. And, please, don't overdo it. LUTs are meant to slightly alter the colors/contrast and to make it more pleasing / fitting. Michael Bay does it wrong. It seems the highlights are brick walled at 50 IRE on the s﻿copes, ﻿I exposed at﻿﻿ 0ev on camera. this is exactly what has happened to me.. did you manage to get a resolution? I'm running into the same issue. When I imported the files into premiere I noticed the highlights were blown out. I checked again in the back screen of the camera and it looks completely different. If I look at the scopes in Premiere and I uncheck the clamp signal box I see that there's information over the 255 values. As a matter of fact, if you mess with the curves you can recover those highlights and make the image look similar to what you see in the back of the camera. I'm guessing all of this has a lot to do with the color space. In pp1 this happens to me, in pp2, the video files look the same on the camera and the computer. PP1 color mode is sgamut3.cine whereas pp2's is rec 709 which is supposed to be a standard. If this settings are supposed to give you a Canon look straight out of the camera with no need to grade, why does this need to be so complicated? Is this an error that I'm getting cause my premiere is not up to date? Is this the correct functioning? There's nothing in the pdf about this issue, so I'm hoping Andrew Reid will throw some light for the ones that are experiencing problems like these. By the way, I used FCPX and got the same result, so it's not premiere. And interestingly enough, if I select NO PP (PP off) I also run into the issue, I'll have to check the xml file and see the colour space that the camera chooses by default. Also, I tried to import both the mp4 and .xml files into premiere, cause I thought it might be helpful but premiere won't import the xml files, it throws an error. It's sort of confusing. I've read a couple things that seem to suggest it's a video card issue (I'm on a 2015 Macbook Pro), but then Resolve handles the footage just fine. It was stated above that the data is all there in FCPX, so you can just correct or LUT it back to where it should be, but personally I'm just running HLG stuff through Resolve. I've actually tried 2 different laptops, from different years, with no luck. Does anyone have a LUT to workout the issue?